It was a cold one on the river today, yesterday was no go 13 below in the morning. Today it was 23 degrees rising to 26 and the water temperature was 34 degrees and probably falling. The ice is melting quickly above zero, increasing ice berg flow in the late day. The only reason why it’s not frozen solid is the river is mostly spring water, a steady 48 degrees. I didn’t know what kind of condition the river was in but I knew it was well frozen after 3 weeks of sub zero temps. Fished from noon to five and swung a black holographic soft hackle and only had a bump. I had to keep moving and that kept me somewhat warm, but winter fly fishing is dealing with cold hands and feet. Nothing rising no trout activity and it was clear. I knew the odds were stacked against me and the hours beat me down, I fished harder as the sunglasses came off and the night was about to happen. I came up to a nice long stretch that was fast, deep, wider due to the water melting ice, the water felt colder and I shook off the fact my hands didn’t work well, I didn’t wear gloves all day, I normally don’t. The soft hackle had to go, my confidence waned I looked through my streamer box quickly as the sun was about set. Fumbling around I found one of two classic Mickey Finns I tied last fall. One was fully dressed and the other sparse. I picked the sparse one and groaned as I could barely make the knot my fingers stiff and numb. A new found confidence as I cleaned the ice out of the guides for the hundredth time, stripped out a good amount of line and sent it to the far bank. On the third cast right before the darkness set in looking west to the glowing orange and purple sky, on extended long cast my line stopped in the middle of the river, it wasn’t a hit, a tug or anything. I knew it could only one thing, I swept my rod to the side the rod heaved and a beautiful trout caught air and bolted down river my clicker and 3 wt rod bucking. 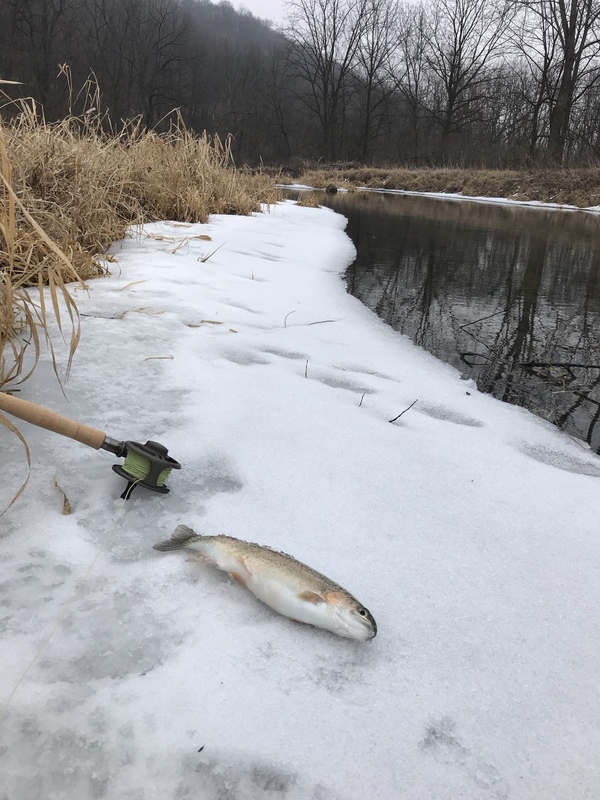 Had all my line out and the fish was running under ice and back into the flow, there was no way to get out of the river due to shelf ice and no way to get the fish to slack water, the current was swift. I did it the hard way pulled that trout up river to me and flipped the fish on water submerged ice shelf because I didn’t have my net today, grabbed my phone snapped a pic, pulled the fly and let it bolt away. Five hours of swinging flies had passed, and I didn’t even hold a trout yet see it for seconds. It was a nice brown and I had landed it in very difficult conditions, I was warm happy and a smile appeared as I saw the glowing sky. Reeling up my line getting ready to wade up and cross dangerous ice to get back to land, I sensed something watching me, I look across river and see an opossum gazing at me, got a couple pics, gave a nod and made my way back to my truck, where heat, coffee and chocolate would be better than anything. To most people, well, I know It doesn’t make any sense this fly fishing and during January at that, but it does to me. The means justifies the ends. Last edited by unknownflyman; 01-19-2019 at 03:37 PM. The scenes remind me of here only it appears to be colder there. Lots of critter tracks and that shelf ice makes it tough huh? Congratulations on having a great day buddy. Thanks Ard, just a friendly reminder to say ice is never safe. I know my rivers well there are areas way over my head, please be safe out there. It’s cold, and a swim can be deadly. Driftless ice is in a constant state of melting, it’s never safe. Beware of ice flows being trapped by shelf ice and thigh high water, a guy can’t escape. Normally I’m off work this time of year, but this week should be great until the snow storm Thursday and then it’s sub zero again. Get out there! I have to work. Polson: Welcome to the forum and congrats on the beautiful bow! Steve: Great trip report and congrats on the beautiful brown! Thanks for sharing all those beautiful winter photos. I'm just not much of a soft hackle fishermen, I probably should use them more often so I can have more confidence that they will work. I missed this one Steve. Great report and thanks for starting the 2018 thread. Welcome to the forum Polson. I live near the Quad Cities. Thanks Ard, Larry, Dewayne. The rivers were in better shape with somewhat warmer weather, but the 13 to 17” snowfall yesterday with warmer weather Till the weekend is going to make a mess of things. Cold this weekend. While it’s good to be employed, I’m not able to capitalize on these occasional days in the upper 30’s. And I’ve been working weekends also. Seen some really remarkable Brook and Brown trout pictures, on the good weather days. Browns in the 20-24” range. If it’s nice get out there, large fish are taking Nymphs, Midges and Stones, with some large fish rising on the warmer days. One thing I’ve noticed is lots of redds from the fall, while I believe all the fish have hatched and moved on, please please watch your step and stay off fresh clean looking gravel, our wild fish need all the help they can get, from the looks of the things the fall spawn was excellent in numbers. Last edited by unknownflyman; 04-07-2018 at 10:00 PM. My daughter has been on me to take her fly fishing since she finished school and finally has some time. Weather forecast yesterday was 50F! It came true and we didn't go because this careless idiot tried to stop a table saw blade with my thumb a few days ago. I got very lucky for sure but I won't be tying any knots for a long while. But I've been tying knots for her for 15 years so it's time she stepped up lol. She knows the clinch and if she'll watch some vids and learn to pre-set up some flies on short tippet with loops this could be easy enough and we'll be back in business. I am dying to get back on the stream. It's been months. I could've only hoped we'd gotten 13-17" of snow. Instead we got rain and January flooding here in the Wisconsin driftless. I would've gone out and taken pics but I've been laid up from the sickness. I got 16” at my place north of the driftless maybe a little more. Snowshoes needed on the river today I bet as there was a foot or more on the ground previously. Dewayne damn dude be careful and Eric sorry you are down with the sickness, it’s bad. As you know from FB I actually had the start of the flu when I started this thread. I didn’t feel quite right fishing that day. I was down for five days, 104 fever. At first I was afraid I was going to die. Then I was afraid I wasn’t going to die. I’m fine now though, took a another 4 days after the fever broke to feel good again. Lots of sleep and pounded water, that dehydration gets people sent to the hospital.